With the Best Exotic Marigold Hotel series seemingly on permanent stand-by, the late-February/early-March release slot has become vacant for something to appease the more senior members of the audience. 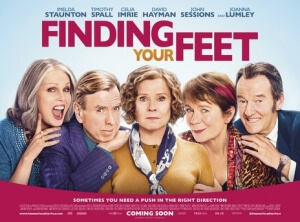 Last year, they were unfortunate to be saddled with The Time Of Their Lives which treated its target audience with such cynical disdain it was hard to stomach; but this year, thankfully, there’s something far more digestible for them to swallow up, in the form of the gleefully inoffensive Finding Your Feet, which though not exactly fresh material is likeable enough to get by just fine. Directed by Richard Loncraine, who in the past has made equally as harmless movies like Wimbledon and My One and Only, the film starts out with “Lady” Sandra Abbott (Imelda Staunton), the wife of celebrated and wealthy police commissioner Mike (John Sessions), discovering that he has been having an affair for the last five years with her best friend Pamela (Josie Lawrence). Furious, she leaves him and seeks refuge at the rugged London council estate flat of her estranged sister Bif (Celia Imrie), but her snobbish behaviour clashes with the more free-spirited nature of her older sibling, as well as that of her friends including Charlie (Timothy Spall), Jackie (Joanna Lumley) and Ted (David Hayman). It’s not until Bif brings a reluctant Sandra along to her local community dance class that she does begin to open herself up a bit more to her new life, and finds herself engaged in a rekindled relationship with her sister as well as making new friends, including and particularly with Charlie. You know exactly the kind of movie you’re going to get as soon as it opens with the kind of soft and easy musical score you’d expect to hear from a movie like this, but unlike The Time Of Their Lives the tone never becomes too unbearable or teeth-gratingly frustrating; instead, it sets you up for something that only wants to put a smile on your face, and for a large chunk of the movie it manages to do just that. This is a rather sweet and likeable movie, certainly sugary and melancholic in places but not to a point where it feels completely manipulative, and you’re glad that it’s taking on some relatively soft material which isn’t too offensive or overly nasty. You’re largely on board with these characters because they’re played by actors who are charming and can use that to their utmost advantage, and since this is a bit more of an ensemble movie than it first lets on it gives each one of the main characters something to do that can flex their acting muscles (though out of all of them, David Hayman – aka Scottish Bryan Cranston, because that’s just what he looks like to me in this movie – probably gets the shorter straw, but he’s still a lively presence when he’s allowed to be). There’s nothing offensive about any of it, not even when it tackles some of the heavier material, and it’s perfectly suitable afternoon viewing that just about anyone can enjoy just fine. I will say, though, that since this is a film targeted for a certain demographic, there is a little bit of pandering every now and then, which can be a little distracting when you’d much rather watch these characters just be themselves and not the easy middle-aged archetypes the filmmakers want them to be portrayed as. It’s got the kind of old-people humour you’d expect from a film like this, whether it’s a joke about using Viagra or a punchline that involves a person suddenly dying (it’s in the trailer, and it’s a minor character, so it’s not exactly a spoiler). Again, though, it’s not as bad as when The Time Of Their Lives tried pulling the same thing and failing miserably, and I’ll admit that there are far more instances of this that work just fine more than there aren’t, but it can just be a bit distracting all the same. Also, don’t go in expecting many clichés to be avoided, because this movie definitely contains a lot of predictable schmaltz that you know every single beat for, especially in its third act. However, the movie coasts just well enough on the charm and likeability of its script, as predictable as it may be, and especially its actors who are all wonderful to see act together. It’s nothing too grand, but after witnessing rubbish like The Time Of Their Lives, the older generation really could have been saddled with something far worse. Finding Your Feet is a harmless and completely inoffensive, if predictable, comedy-drama aimed at the older generation which coasts along just fine off of its charming and likeable characters and actors alone, though it certainly tends to pander a little too much to its target audience, far more than it probably needed to.